A top South Korean official told lawmakers on Monday that Kim Jong-un’s regime in North Korea is estimated to have up to 60 nuclear weapons, the country’s first public admission about the size of the Pyongyang’s nuclear arsenal. Responding to questions from lawmakers, Unification Minister Cho Myoung-gyon told the South Korean parliament the reported view of intelligence that agencies believe the size of the North’s nuclear arsenal ranges from 20 bombs to as many as 60. It was the first time a senior Seoul official has publicly spoken about the size of the North’s secretive haul of weapons. The Unification Ministry later clarified that Cho’s comments did not mean that Seoul would ever accept North Korea as a nuclear power, maintaining that they would continue diplomatic efforts to rid the North of its illegal nuclear program. The country’s leading spy agency, the National Intelligence Service, did not comment on the remarks. Such estimates roughly fall in line with those reached by independent experts. This year, a team of Stanford University scholars concluded that the regime possessed a highly enriched uranium inventory sufficient for around 25 to 30 nuclear devices. 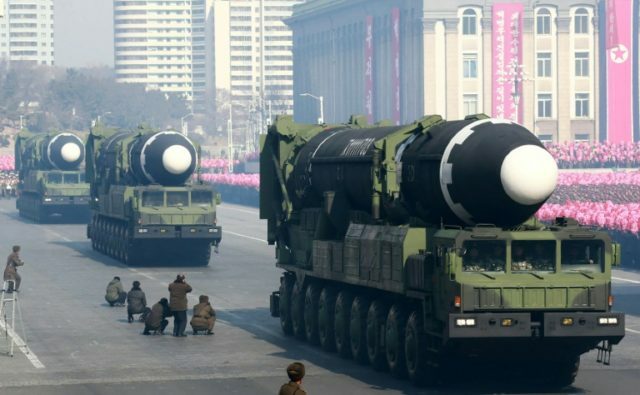 Reports previously released by the South Korean government found that the North has produced approximately 110 pounds of weaponized plutonium, capable of producing at least eight atomic bombs. The revelation came before North Korea warned on Tuesday that the United States must not use a peace treaty ending the Korean War, which began in 1950, as a “bargaining chip” in negotiations. They also claimed that they have made significant efforts to end hostilities, but that the U.S. continues in “trying to subdue” it through economic sanctions. On Tuesday, U.S. Secretary of State Mike Pompeo announced that he would make another trip to Pyongyang in preparation for another denuclearization summit between President Donald Trump and Kim Jong-un. “These conversations are going in the right direction, and we feel confident enough to hop a plane to head there to continue the conversations,” State Department spokeswoman Heather Nauert told reporters.